Braided wig with gold beads. The wig features an elastic band for a comfortable and secure fit to almost any head size and is available in auburn, black, blonde, and medium brown. 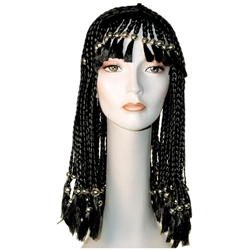 The Braided Wig with Beads is a cornrow style wig that is perfect for a number fo different characters including Cleopatra, Stevie Wonder, or Bo Derek.